The decorations are going up, the Christmas shopping has begun – are you getting excited? Or does it fill you will dread, stress, worry and anxiety? Christmas is not a happy time for everyone! 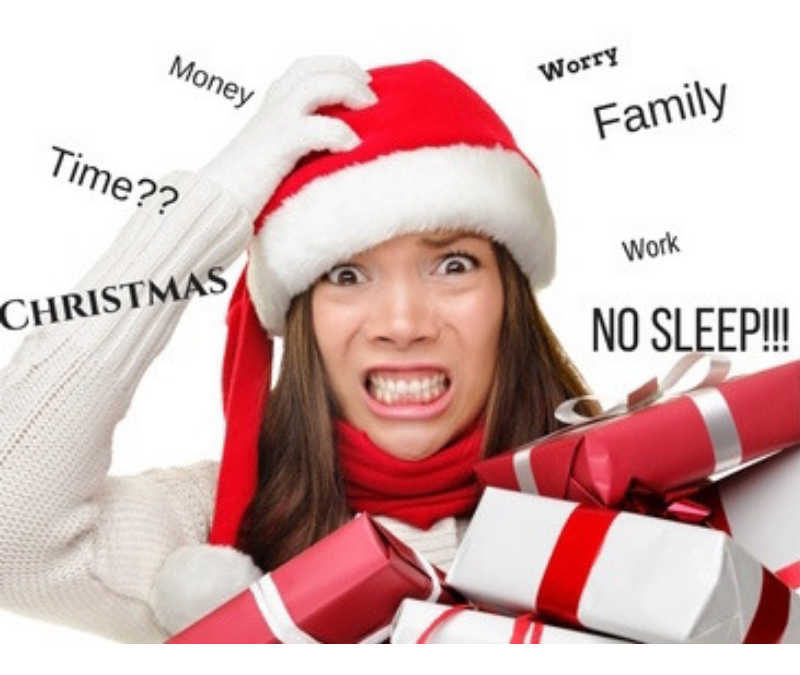 With worries about money, fallouts between families and loneliness or the loss of a loved one – it is not surprising that many people are not looking forward to the festive period. Regardless of how you feel about the upcoming season, you don’t need to feel overwhelmed or anxious. After all, anxiety isn’t something that happens TO us, it is something that we create. Here are FIVE tips for how to Thrive though Christmas and keep your emotions and thoughts positive. So while some people are running around with a totally glittery, magical view of Christmas, just take a minute to think about your perspective. It may not be the same as those people, but is your perspective true to the reality? Or do you have a thoroughly dark, gloomy perspective on the matter? The fact of the matter is – It’s just day. You don’t have to have a love it or hate it approach. It’s not about spending a fortune, buying mountains of presents, keeping everyone happy. It’s not even about spending time with loved ones if you don’t want it to be! The gloomy perspective you have is just making you stir up unhelpful, unwanted emotions in you, so why not decide to just be indifferent? Decide on a more helpful perspective that is more true to the reality of the situation. It doesn’t have to be one extreme or the other. Be aware of the thoughts and emotions you are creating around Christmas. Are thoughts like “I can’t cope” “What am I going to do?” “I hate this” helpful to you? Of course they aren’t. All they are doing is creating negative feelings and emotions. Just remember that these don’t impact anyone but YOU! I’m not saying that you have to pretend to be excited. But constantly thinking about how bad everything is, comparing yourself to others and thinking about how bad things are only makes you feel worse. These thoughts will not change things. Instead, decide to take action! Think helpful, more in control thoughts “Christmas is whatever I chose it to be” “I am not going to put pressure on myself” “I am going to make the most of it by…” By doing this, you will be able to make more helpful choices and take action that will have a more positive outcome. Your thoughts and emotions are your choice. If you are not happy with them – change them. Instead of focussing on all of the Christmas going’s on to complain and grumble about (Bah humbug!). Wouldn’t it be better to find some things to be positive and grateful for instead? I wonder which of the two will make you feel happier, calmer and more relaxed? What do you mean there are no positives!? Of course there are! They are in the smallest things going on around us, we are just out of practise in finding them! They don’t have to be Christmas related, they can be any small, tiny thing. Try looking out for 2-3 a day and spending time thinking about WHY they were positives. I read a book I’ve been meaning to for ages……. Hiding from Christmas/family/situations is not the answer. This may fool you into thinking that your worries and anxieties have calmed by avoiding them, but the fact of the matter is that the problem is still there! This goes back to the unhelpful thoughts I mentioned earlier – they can create all kinds of fears and anxieties that don’t need to be there. Set yourself a small, achievable challenge in the run up to Christmas and start proving to yourself that when you step a small amount out of your comfort zone – you can achieve things you didn’t think you could! Try this tip – when you have decided on a small challenged (remember, it has to be something achievable) imagine it going well in your head. Close your eyes and picture it going brilliantly! It might take a bit of persistence because we are pros at imagining things going wrong! But keep at it and keep your imagination on track. When you visualise things going well, they are more much likely to happen! Okay I don’t mean the effing and jeffing as such, but studies show that the language we say (and think) has a direct impact on our life! If you spend all your time making using words like “terrible” “awful” “unbearable” “hate” “can’t” – then just remember that scientific evidence shows that this words have a physical impact on your body, brain and mood. It’s not about changing your words for positive ones when you don’t really mean them. Not every situation calls for positivity. But you can use powerful, in control language instead. The impact these different sets of language can have on you physically is astounding! So when it comes to the festive season. Mind the language that you say and think! If you are thinking that these things are easier said than done and that you can’t help the way that you think and feel then maybe it’s time to get some support. All of these things are just bad habits that we have developed over time. They are not permanent features of your personality. But, as they say, ‘Old habits die hard’ and if you would like some training and support to help you to make these changes then this is where The Thrive Programme can help you. You can learn how to change these thinking habits in just 6-8 sessions and be rid of feeling this way for good!